Home / Tech Talk / Is it time to shovel your roof? Is it time to shovel your roof? To Shovel or Not to Shovel…. that is the question! We all saw pictures of the Dome collapse over this past weekend, but the Dome is the exception to the rule of what facilities are designed for here in Anchorage. In the Municipality of Anchorage (MOA) the minimum required snow load is 40 psf. This is a minimum required by the MOA regardless of the pitch or type of roofing you have on your roof. Some critical facilities or new facilities with flat roofs may be designed for higher loads. That’s great info…but how much snow weighs 40 pounds per square foot? This translates into roughly two and a half feet of accumulated snow on your roof. This depth varies depending on the type of snow (light and fluffy or wet and dense). If it snows 2’-0” overnight, and the snow is light and fluffy, the snow will not have compacted and you don’t have anything to worry about yet. Consider shoveling your roof after the snow gets to 2’-0” to 2’6” of accumulation, so that the next time it snows you don’t get in trouble. If you have an older home, you might want to consider clearing it at about 1’-6” to 2’-0”. Check that any areas where drifting snow might accumulate have adequate structure. This might be trusses or joists that are spaced closer together than in other areas, or larger joists or trusses than in other areas. 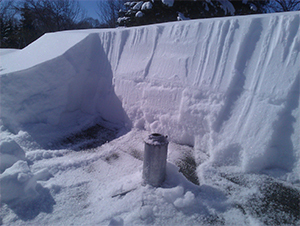 If you have a flat roof consider clearing it at around 18”. While large snow loads might not cause a collapse, they can cause large deflections which can lead to ponding and/or leaks. Ice is roughly four times denser than snow, so watch for ice build-up. Be aware that there are additional factors for safety built into building designs, so your roof is not likely to collapse when the snow hits two and a half feet. Also keep in mind that there is probably less snow on your roof than on the ground, so measuring the snow in your front yard will not give you an accurate depth of the snow on your roof. We hope this is helpful! Please comment if you have any questions.